Mobile Nations No Tricks, Just Treats Halloween Costume Contest! With Halloween falling on a Wednesday this year, we know a lot of you will be out this weekend in costume getting your party on. Odds are you'll be carrying a phone in your pocket too. Heck, some of you will probably even be dressed up as a phone or tablet. We had a great time with our Halloween Costume Contest last year, so we're making it an annual event! While you're out in costume, be sure to snap a photo with your phone (or tablet) in hand. Then email it to us. We'll put together all the photos receive into a sweet video for the blogs. And beyond that, you can win some awesome prizes for taking part. Full details below! When you're out at Halloween parties this weekend or out trick or treating on Wednesday, get a photo snapped of you in costume holding your smartphone and/or tablet visibly out in hand. Be scary, funny or do a crazy pose. Whatever you want is cool. Have fun with it. For brownie points, load up WPCentral.com in the web browser or throw a WPCentral wallpaper on. Group photos with friends and co-workers are welcome too. 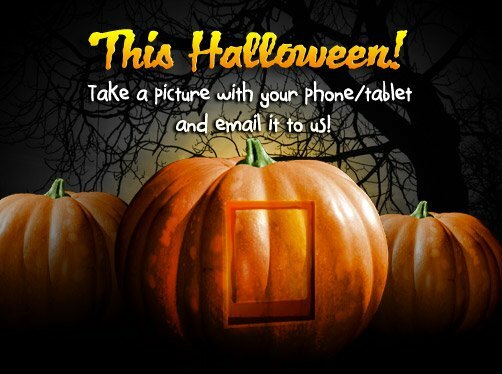 With your photo taken, all you need to do is email it in to halloween@mobilenations.com by midnight PST this Wednesday, October 31st. It would be super helpful if you renamed your photos with your username. Also, if you would like to include a caption or any other information about your picture, be sure to send it in. Come November 1st we'll go through all the photos and pick out a bunch of winners in a variety of categories - scariest costume, funniest costume, sexiest costume, best group photo and more! We'll put all the winners and other photos received into a video collage and post it up on the blogs Tuesday afternoon. As for the prizes? Well... it's Halloween - which means you might get a treat, or this could all be just a nasty trick. But you know us... we like treats. We're going to keep the treats a surprise though, so take your photo this Halloween, email it in, and stay tuned. From all of us at WPCentral and the Mobile Nations team, have a safe and happy Halloween! !